The Crate Escape is one of Wario Man's microgames found in WarioWare: Touched! in the Super Zero stage and one of Wario Deluxe's microgames in WarioWare Gold. The microgame's name is a pun on the name "The Great Escape." 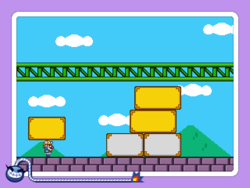 The objective is to use the blocks Wario carries to make a tower of blocks by putting blocks on top of the others for Wario to climb to reach the girder. If the player drops a block, they can always take another one (this does not make the player lose the microgame). 1st level difficulty: Starting with a big block and a small block, big blocks have to be used to make a tower. 2nd level difficulty: Starting with one small block, big and small blocks have to be used to make a tower. 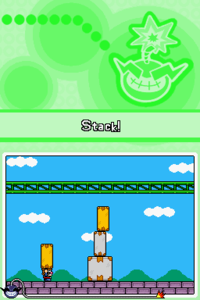 3rd level difficulty: Starting with one small block, big blocks have to be used to make a tower. This page was last edited on February 9, 2019, at 09:31.